Thanks to almost a decade of working together via delivery of the ‘Woodland to Workshop’ course, it became a natural step for Woodland Heritage to become the owner of Whitney Sawmills. This highly respected business had been established by local craftsman, Will Bullough, in the early 1990s at a time when Will, as a craftsman, had become increasingly frustrated with the quality of the timber available to him so he decided to try milling and drying his own materials little realising what this experiment would eventually lead to. The sawmill grew steadily to become a UK-wide supplier of timber to businesses of all sizes from the grand Dumfries House project in Scotland to one-man boat builders in Cornwall. Over the years the mill has supplied many exciting prestige projects such as fine Oak for the King’s Dining Room in Edinburgh Castle, or Sweet Chestnut for the royal row barge, Gloriana. More recent projects include milling Oak and Elm for the restoration of HMS Victory and, more locally, the rebuilding of Grade 1 listed Llwyn Celyn just over the border in Wales. A sawmill is at the centre of the timber supply chain although it has become increasingly rare as a type of business with a huge reduction in the number of hardwood sawmills in the UK in recent years. Woodland Heritage believes that, with the right approach, a healthy future exists for those that remain; something that it wanted to demonstrate by taking over Whitney Sawmills. As well as supplying the varied demands of its customers, Whitney Sawmills also helps to keep rural employment and skills alive. Whitney Sawmills isn’t just a supplier; it’s also a customer, buying timber from local landowners and helping to secure the jobs that they in turn offer. It has also always been a priority at Whitney to aim to benefit woodland wildlife wherever possible, as so often it is lack of woodland management that is creating the greatest threats to many endangered species. Whitney Sawmills supplies a range of different timbers specialising in Oak, although Douglas Fir has become increasingly popular in recent years. Other hardwoods supplied include Ash, Elm, Sycamore, Sweet Chestnut, Cherry and Poplar, with Walnut, Alder, Lime and Maple occasionally available as well. 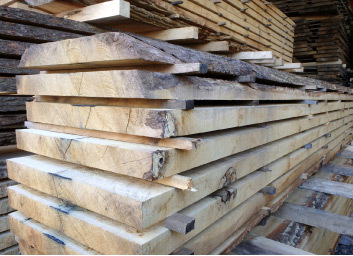 The vast majority of planking stock is milled off-site and then air-dried in a large barn, although some stock is kiln-dried to reduce moisture content further for internal uses in particular. Kiln-drying takes over from the air drying process which, with the most commonly supplied Oak planking, can normally be assumed to take one year for each inch of thickness. Air drying goes down to 16-17% compared with10-12% moisture content with kiln drying. Tongue-and-groove flooring as well as skirting, architrave and cladding have all been growing as sales products, although the other major product in demand besides planking is beaming, which is taken in as green logs and then milled on-site to order. Where possible ‘falling-boards’ coming off the saw will be retained for use as flooring or planking, but otherwise the main by-product created is firewood that is sold in bulk (slabwood), as well as by the sack to the general public. Customers include joiners, cabinet makers, timber framers, builders, architects and DIY woodworkers and whilst a good proportion live and work within a 50-mile radius of Whitney, many orders are shipped each year across the UK; one of the attractions that draws customers to Whitney Sawmills is its ability to fulfil customised orders. Whitney Sawmills has always supplied both UK and European timbers with Woodland Heritage’s aim being to increase the proportion of timber sourced from the UK and especially from the West Midlands and Wales. Woodlands in this area are often under-managed, reflective of the trend nationally, which led to the project to create a hardwood roundwood price index and video.